In our Senior Phase (Year 10 -12) we prepare students to lead happy and purposeful lives. This is achieved by meeting the academic, social and emotional needs of the adolescent through an environment which encourages purposeful work, life experience and a love of learning. When you walk into the Senior Phase environment the first thing you notice is it looks and feels more like a creative workspace or university than a school. One student adds images and words to a timeline of human conflict over the past century that stretches across the whole room. Another student is editing a Science film – an animation showing where the atomic elements used in mobile phones are sourced. Nearby a maths teacher and students investigate how to apply their knowledge of trigonometry to the designs of their scale models of buildings. In the room next door a teacher and students plan an upcoming community event, and on the verandah overlooking the bushland a student works independently, adding the finishing touches to a painting. These are self-motivated students with a love of learning. This is a normal day in the Montessori International College Senior Phase program. A typical morning begins with a community meeting to plan the day, teachers check how students are going and everyone discusses current events in the news. Some students then break off into groups for specific academic classes such as English or Mathematics. Other students work independently – completing assessments tasks for university or TAFE courses. Students use the kitchen to make lunch for themselves or they work together to create a communal meal. A question about platypuses becomes a study of the monotreme’s natural environment and before long this leads to an investigation of the creek that runs through our rainforest, involving students testing the water and looking for evidence of burrows. The last part of the day is spent looking after their environment; washing dishes, sweeping floors, watering plants and tidying in preparation for tomorrow’s classes. At Montessori International College students are not only given clear pathways to university and future employment, they are given the practical skills they will need for their future independence. Year 10 is the admissions point for the International Baccalaureate (IB) program. It is a preparation year for the IB and follows the ACARA and QCAA guidelines. The year leading up to the IB Career-related Program is important because it gives students the opportunity to prepare for what is to come. Students are aware of the program format and requirements to allow a smooth transition from Year 10 into the IBCP in Year 11. To this end, Year 10 at MIC provides students with exposure to key experiences from the IBCP. 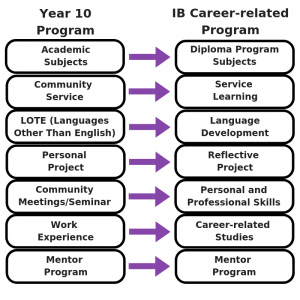 The following briefly describes how the Year 10 program is aligned with the IBCP. Subjects are assessed in a similar manner to IB assessment and graded on a 1 – 7 scale. The IB Learner Profile forms the basis of student learning experiences. Year 10 students spend a morning a week in a diverse range of community service activities. Students gain the benefit of helping the community as well as exposure to the idea of Service Learning. 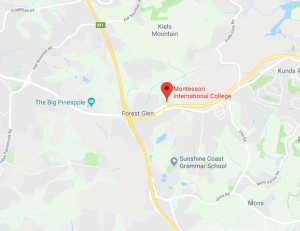 The Year 10 community service program is arranged by the school, however students are encouraged to develop their own ideas for helping the community. Year 10 students choose a language that interests them and study it online. In addition to the language studied, students will explore the culture of their chosen language. Students complete a small language portfolio that contains their achievements and reflections on their LOTE experiences. The LOTE program is supervised and guided by the school language teacher (Mandarin). Student progress is reported on based on a modified version of the Language Development syllabus reporting guidelines. The Year 10 Personal Project allows students to pursue an area of passion, such as writing a play, building a boat, making a film or starting their own fashion line. The Personal Project is an opportunity to undertake a creative, innovative and substantial venture and is designed to put creative theory into practice over an extended period of time. Under the guidance of their mentor students will undergo a process of exploring ideas, designing, developing, testing and modifying. The project starts in the very first week and takes four terms to complete with the final product publicly displayed at the Project Exhibition at the end of the year. The Personal Project will help students prepare for their final years at school and allow them to learn and practise qualities (the Learner Profile capacities) that will be essential for life beyond school. This is a valuable time where the Senior Phase community comes together on a weekly basis. Seminar is a useful platform for allowing students to explore concepts that will be part of their IB Career-related Program, such as ethical dilemmas and case studies and community issues (school, local, national, global). Students identify a career interest and spend time in that industry. Cambodia Trip – An optional overseas trip with the school to Cambodia on a “Community and Culture in Cambodia” experience. Students will take part in an active service project in a community in Cambodia. Each student belongs to a mixed age mentor group in the Senior Phase. The group is managed by a Senior Phase teacher who meets with the group every morning to mark attendance and plan the day. Mentor time is also spent socialising with the students, student support, discussing any issues and participating in fun activities. The Mentor Program will continue as students move into the IBCP. The Mentor teachers are also IB teachers, so will have a knowledgeable support base for students in the IBCP. In Years 11 and 12 students will now study the International Baccalaureate Career-related Program.